Ali's career took off in 1964 after defeating Sonny Liston in Miami Beach. Miami is where he trained and radicalized as a Muslim, opposing the Vietnam War. It was 52 years ago in Miami Beach when an underdog American boxer named Cassius Clay "shook the world" by dethroning the mighty Sonny Liston to become the heavyweight champion of the world. It was the last time Clay used his real name in the ring. Right after that victory in February 1964 he announced he was changing his name to Muhammad Ali and joining a religious black power movement. “Cassius Clay is a slave name. I didn’t choose it and I don’t want it. I am Muhammad Ali, a free name,” he declared. Clay had burst onto the boxing scene less than four years earlier when he won the gold medal at the 1960 Rome Olympics, aged only 18. Momentous battle in the ring later in his career would be dubbed the "Thrilla in Manila" and the "Rumble in the Jungle." But it was the Miami Beach bout with Liston that launched the legend of a man who would go on to proudly proclaim himself “the greatest thing that ever lived." The Liston fight “made him a celebrity” according to Ferdie Pacheco, Clay's ringside doctor and the sole surviving member of the boxer's ringside team. "It made him great, and everything that he did always seemed to work out," he told Reuters in an interview last year. 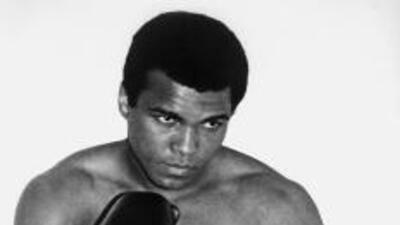 Ali passed away June 3, aged 74. Born in Louisville, Kentucky, Ali spent his formative years as a boxer in Miami, living for about six or seven years from 1960-67 in a modest, single-story home in a black neighborhood in the north of the city, Gonzalez noted. “Miami is where he trained, it’s where he fought, and it’s also where he radicalized politically,” said Gonzalez, 48. A plaque commemorates the bout at the entrance to the Miami Beach Convention Center where the six-round fight was held. At the time Miami Beach was emerging as a popular tourist destination. Only the week before the Clay-Liston fight the city had hosted the Beatles for their second appearance on the Ed Sullivan Show, broadcast live from the beachfront Deauville hotel. Ali trained at the Fifth Street Gym on Miami Beach, a block from the ocean in what has since become trendy “South Beach.” The old gym, a second floor walk-up, was knocked down in 1993, replaced by shops and a parking lot. The civil rights movement was boiling at the time in the wake of the famous 1963 March on Washington. South Florida was still segregated and blacks were not welcome in some hotels and parts of the beach. Instead, Ali hung out across the bay in Miami’s black Overtown district, famous in its day for live jazz clubs. Stung by his lack of public acceptance after his Olympic achievement, Ali was also secretly meeting with Malcolm X, the leader of the Nation of Islam, a movement of black muslims. His fight team kept that a secret as they knew if it came out Miami Beach officials might have cancelled the Liston bout. While making his film Gonzalez recalls interviewing former neighbors of Ali in Miami. One recalled theological arguments over the fence with Malcolm X who often visited Ali’s house. It was also on Miami Beach that Ali teamed up with his famous trainer and “cornerman” Angelo Dundee, at the Fifth Street Gym. Dundee saw promise in the brash young Clay. But the boxing world didn’t give Cassius Clay much of a chance against Liston who was 35-1 and had built a reputation as unbeatable brute. Dubbed “the Big Bear,” he had learned to box in jail. "There was sheer terror Liston was going to kill us," Ferdie Pacheco, Clay's ringside doctor and the sole surviving member of the boxer's ringside team, told Reuters last year. "Clay was taunting him and you don't make a giant like that mad." Clay’s unique boxing style was also questioned by experts as he had a tendency to dance around the ring dodging punches. He would later coin the phrase; "Float like a butterfly, sting like a bee. His hands can't hit what his eyes can't see." “Angelo managed him very carefully. He knew he was flawed, but he could see his talent as well,” said Gonzalez. Ali would remain in Miami until 1967 when he famously refused the military draft saying he wanted no part in the Vietnam War. “I ain’t got no quarrel with them Viet Cong,” he declared. Denied a boxing license, he did not fight from March 1967 to October 1970. He remained close to his friends in Miami, though Pacheco would counsel him as early as the 1970s to hang up his gloves for health reasons. “Ferdie went to everyone and said ‘this has to end,’” said Gonzalez. “He could tell something was wrong, but the circus had to go on,” he added. Ali fought on until 1981, aged 39, compiling a career 56-5 record, losing three of his last four fights. Ali battled Parkinson's disease for more than 30 years before he died on Friday after being admitted to hospital in Phoenix, Arizona, with a respiratory condition. Gonzalez sat down with Dundee before he died in 2012, aged 90, to record an interview for the “Made in Miami” film. “We took a VHS tape of the Liston fight and watched it with him,” Gonzalez recalled. “He hadn’t seen it in 40 years. He gave us a running commentary and he was still excited by it. It was such a special fight, a special moment,” he said.